A dose of sugar given as a gel rubbed into the inside of the cheek is a cheap and effective way to protect premature babies against brain damage, say experts. 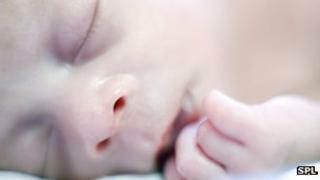 Dangerously low blood sugar affects about one in 10 babies born too early. Untreated, it can cause permanent harm. Researchers from New Zealand tested the gel therapy in 242 babies under their care and, based on the results, say it should now be a first-line treatment. Their work is published in The Lancet. Dextrose gel treatment costs just over £1 per baby and is simpler to administer than glucose via a drip, say Prof Jane Harding and her team at the University of Auckland. Current treatment typically involves extra feeding and repeated blood tests to measure blood sugar levels. But many babies are admitted to intensive care and given intravenous glucose because their blood sugar remains low - a condition doctors call hypoglycaemia. The study assessed whether treatment with dextrose gel was more effective than feeding alone at reversing hypoglycaemia. Neil Marlow, from the Institute for Women's Health at University College London, said that although dextrose gel had fallen into disuse, these findings suggested it should be resurrected as a treatment. We now had high-quality evidence that it was of value, he said. Andy Cole, chief executive of premature baby charity Bliss, said: "This is a very interesting piece of new research and we always welcome anything that has the potential to improve outcomes for babies born premature or sick. "This is a cost-effective treatment and could reduce admissions to intensive care services, which are already working at high capacity levels. "While the early results of this research show benefits to babies born with low blood sugars, it is clear there is more research to be done to implement this treatment."